Thermal Stability test the Degradation of PVC material at high temperature. Thermoplastics and PVC (Plasticized Polyvinyl Chloride) materials when exposed to continuous heat, degenerates and emit harmful acidic gases. 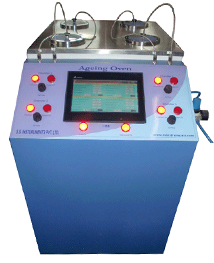 The instrument is manufactured for testing PVC materials against their thermal stability at higher temperature. Thermoplastics and PVC materials when exposed to continuous heat, degenerates and emit harmful acidic gases. 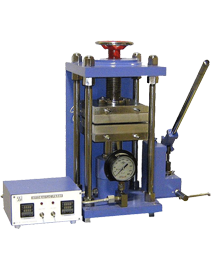 The instrument is manufactured for testing PVC materials against their thermal stability at higher temperature. The basic principal is that the pH paper changes its color when it comes in contact with halogen gases, released by PVC and its compounds on heating at higher temperatures. One solid Aluminum block used as the heating medium. 15 holes are drilled in the aluminum block for keeping the sample. Specially designed embedded / Jacket heaters in the thermal block. Digital Temperature Indicating Controller for precise setting & control of temperature. Consumables like ph paper & test tubes are not part of the standard equipment and are available at extra cost. A stop watch has to be provided by the user.